Location: Primorsko Del Sol hotel is situated in the southern part of town, 200 metres from the centre and 50 metres from the beach. 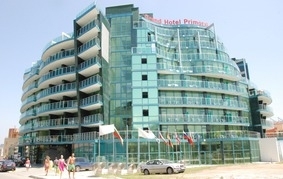 Accommodation: Primorsko Del Sol Hotel offers 160 double rooms and 12 apartments. Most of the rooms offer a wonderful sea view. Every room and apartment in Grand Hotel Primorsko is elegantly furnished with functionality and taste. Their affable atmosphere and luxury furniture guarantee unforgettable stay for evey guest. Wine & dine: The Hotel offers a spacious and stylish main restaurant serving varied buffet breakfast, lunch and dinner, as well as an a la carte restaurant where guests can enjoy delicious European cuisine. Conference centre: The hotel is an excellent choice for business events.The complex has a modern furnished conference room and the staff handles great with personal and corporate events. Sports and entertainment: The hotel offers two swimming pools and a modern and cozy spa centre for the complete relaxation. The night club of the hotel offers evening animation for small and grown ups. There is also a special area for children.